Asian Tsunami+5: It’s governance, stupid! This montage of satellite images was taken by the DigitalGlobe Quickbird satellite. It shows a portion of the south-western coast of Sri Lanka, in Kalutara, some 40km south of the capital Colombo. 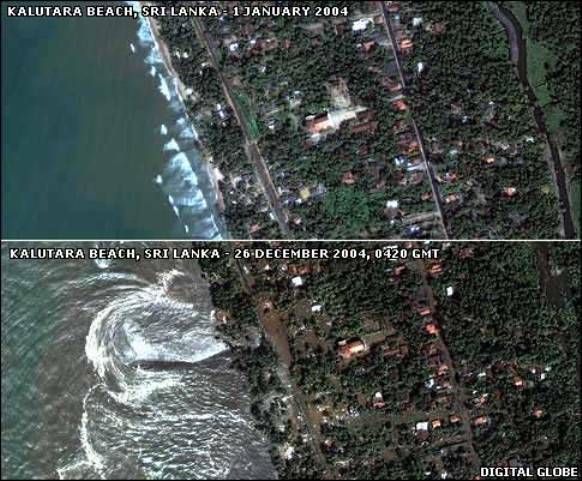 The lower image was taken on Sunday 26 December 2004, at 10.20 am local time, shortly after the moment of impact of the Indian Ocean tsunami that wreaked havoc in South and Southeast Asia that day. For comparison, we have an image of the same location on a normal day a few months earlier. The tsunami was one of the most widely photographed and videographed disasters in history. In fact, it marked a turning point for citizen journalism in Asia. For many of us in the media and communication sectors, this was the biggest story of our lives. Because the killer waves hit numerous coastal locations in several countries, this disaster’s ‘Ground Zero’ was scattered far and wide. Not even the largest news organisations could see, hear and capture everything. Everyone had to choose. And not just geographically, but thematically too, the tsunami’s impact was felt across sectors, issues and concerns. That provided both ample scope and many challenges for journalists, aid workers and others who rushed to the multiple scenes of disaster. But there was a downside. Because the tsunami’s scale was so vast and its effects spread so wide, no single individual or organisation could comprehend the full picture for months. For many of us in the Indian Ocean rim, culturally unfamiliar with tsunamis, it was as if a Godzilla had stomped through our coasts. Grasping the full, strange phenomenon was hard. Journalists, professionally trained to hastily produce ‘first drafts of history’, found it a bit like being close to a huge tapestry still being woven: we all absorbed parts of the unfolding complexity. We reported or analysed those elements that held our interest. But we were too close, and too overwhelmed, for much perspective. Five years on, we can ‘zoom out’ more easily to see the bigger picture. When I do, one overarching factor stands out as the most important and lasting lesson of the tsunami: the need for better governance. The absence of good governance was at the root of most major stories about the tsunami. It cut across every level in our societies — politics, public institutions, corporate sector, humanitarian agencies, academia and civil society. This is the thrust of my latest op ed essay, written in time for the tsunami’s fifth anniversary being marked today. I briefly recall three aspects of the tsunami that I covered as a journalist — early warnings, deluge of aid and environmental lessons — to show how the absence of governance aggravated matters in each case. The lesson is not simply one of academic interest: it holds many practical, survival level implications. I end by quoting Maldivian President Mohamed Nasheed, who argues that democracy and good governance are also the most important elements in climate change adaptation.